W. W. Norton & Company, 9780393292473, 368pp. The Green movement in America has lost its way. Pew polling reveals that the environment is one of the two things about which Republicans and Democrats disagree most. Congress has not passed a landmark piece of environmental legislation for a quarter-century. As atmospheric CO2 continues its relentless climb, even environmental insiders have pronounced "the death of environmentalism." 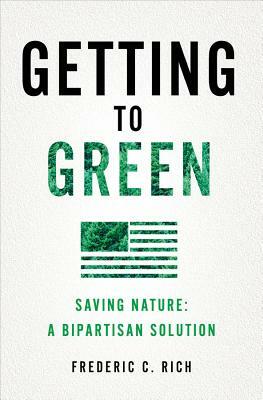 In Getting to Green, Frederic C. Rich argues that meaningful progress on urgent environmental issues can be made only on a bipartisan basis. Rich reminds us of American conservation's conservative roots and of the bipartisan political consensus that had Republican congressmen voting for, and Richard Nixon signing, the most important environmental legislation of the 1970s. He argues that faithfulness to conservative principles requires the GOP to support environmental protection, while at the same time he criticizes the Green movement for having drifted too far to the left and too often appearing hostile to business and economic growth. With a clear-eyed understanding of past failures and a realistic view of the future, Getting to Green argues that progress on environmental issues is within reach. The key is encouraging Greens and conservatives to work together in the space where their values overlap--what the book calls "Center Green." Center Green takes as its model the hugely successful national land trust movement, which has retained vigorous bipartisan support. Rich's program is pragmatic and non-ideological. It is rooted in the way America is, not in a utopian vision of what it could become. It measures policy not by whether it is the optimum solution but by the two-part test of whether it would make a meaningful contribution to an environmental problem and whether it is achievable politically. Application of the Center Green approach moves us away from some of the harmful orthodoxies of mainstream environmentalism and results in practical and actionable positions on climate change, energy policy, and other crucial issues. This is how we get to Green.